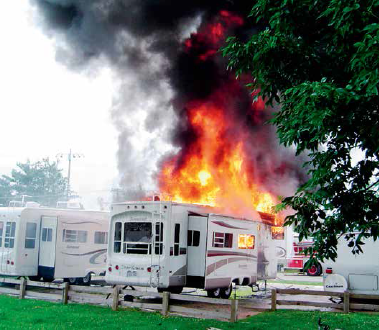 Lessen the risk of an RV fire by following these simple steps. Watching your pride and joy go up in smoke is something you never want to happen. Following a spate of large or total loss RV fire claims that the team at Ken Tame and Associates have seen over the past 12 months, we thought it timely to take the opportunity to remind you of some common-sense RV fire safety tips, to highlight some of the causes of RV fires. Following these steps won’t take too much effort and will hopefully assist you to reduce the risk of these types of fires from occurring. The way RVs are constructed and the materials used means they have the potential to burn very quickly. If you’re inside your RV, you could literally have just seconds to escape once a fire breaks out. The best thing, of course, is to lessen the risk of fire in the first place. We’re not fire safety experts, so we recommend you spend some time researching RV fire safety and educate yourself in this area – there are many excellent resources available. You never know, you may need to save your vehicle one day or, more importantly, yourselves and your loved ones. Unfortunately, sometimes even the best made plans and levels of preparedness cannot prevent the inevitable from occurring, so it is vital that you have the appropriate level of Comprehensive Recreational Vehicle Insurance in place. As they say, ‘prepare and prevent, don’t repair and repent’. Here are some common-sense RV fire safety tips that we have gathered to help keep you safe on the road. This one sounds very basic, but is worthwhile mentioning as your detectors may be your first warning that something is out of kilter. Just like in your home, make sure your smoke detectors have fresh batteries in them at all times. A good rule of thumb is to change all the batteries every six months. To make it easier to remember, you could do this on the days that the clocks are adjusted for daylight savings time and back again, so you have a clear marker of time. Make sure a licensed LPG technician has certified the vehicle. It’s a good idea to have it re-certified every few years. They will inspect and test the gas system and check for any leaks. If you ever smell gas, vacate the RV immediately, call the fire department and, if possible, turn off the external gas tanks. Lastly, always ensure your RV displays where your gas cylinders are located. This is vital information for the fire brigade should they need to attend to your vehicle. Taking this precaution will lessen the added worry as to whether you remembered to turn off the gas when you go to refuel, travel through a tunnel, or board a ferry, etc. While RV electrics are better today than ever, they can only handle a certain amount of load. So when it comes to electrical outlets, avoid plugging too many things into one outlet, especially high draw appliances or heaters. Try to spread the loads out between different outlets. Use a voltage meter and test how much current/power you may be drawing. Occasionally feel the electric outlet plates and main electrical breaker panel and see if anything is getting hot. If you feel they are excessively warm to the touch, call an electrician and have them checked out properly. It’s also worth getting a good quality surge protector to offer protection against power spikes. Care should be taken around cooktops especially when bench space is minimal. 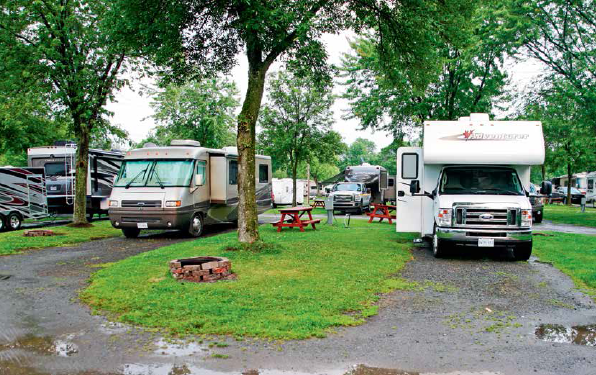 It’s especially important to keep RV appliances clean and maintained. Number one on that list is the refrigerator – one of the most common causes of RV fires. For example, if your vehicle has been in storage and some vermin make a nest near the fridge’s gas burner, the next time you use the fridge in the gas mode, you may risk having a fire on your hands. Also visually inspect the wiring and circuitry for any signs of overheating or loose connections. If you spot anything suspicious call in an RV technician to take a look at it. 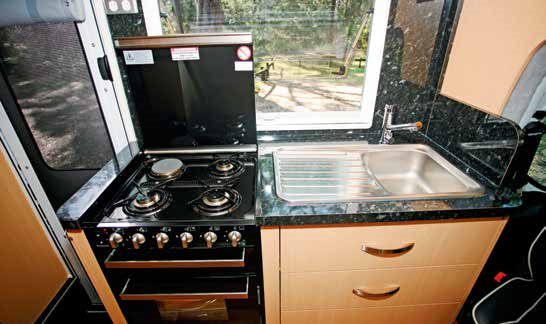 RV kitchens can be cramped, with only small amounts of bench space, so you need to be extra careful when preparing your meals and ensure you keep the stove area clear. Under no circumstances should you ever leave a burner on when you’re not present and always keep a fire blanket within reach. Also, remember that the stove and oven’s gas burners eat up oxygen, so make sure to leave open the RV’s roof vents or open a window to let in fresh air while you are cooking inside. Keep tyre pressures inflated to a level appropriate for the road. You wouldn’t think tyres and bearings would be a fire threat; however, they are a not so uncommon cause of burnt out RVs. If an axle bearing fails it can overheat to the point of igniting the tyre, and once the tyre gets fully engulfed, it is very hard to put out. The fire can then spread and the whole vehicle can quickly go up in flames. With this in mind, always maintain the wheel bearings, especially those of trailers. Have them inspected and re-greased at the recommended times. Keep tyres inflated to appropriate levels for the load. Under-inflated tyres can heat up very quickly. After travelling, check all the wheels and tyres for heat. Do it often and you will get a feel for the average heating and will then know when one is out of the acceptable range. A fire in a crowded park can be a potential disaster - prevention is the best solution. Keep the barbecue and campfire well away from the RV, considering the wind direction before lighting up. When barbecuing, you can occasionally create flare-ups, especially with meat that has a high fat content, such as sausages and burgers. Pay attention to local fire bans. You don’t want to be the person who starts a bushfire! Keep several fire extinguishers on board the RV – one in the entrance or kitchen area, another in the bedroom and a third in an outside storage compartment. This way an extinguisher is always handy and you have several back-ups, if needed. Don’t forget to have them serviced yearly and replaced them when they expire. Visually check your fire extinguishers often to ensure they contain the proper pressure on the gauge (within the green range), but never test an extinguisher by partially discharging it. You should carefully read the instructions on your fire extinguishers and familiarise yourself with how to operate them; you won’t have time when there’s a fire. 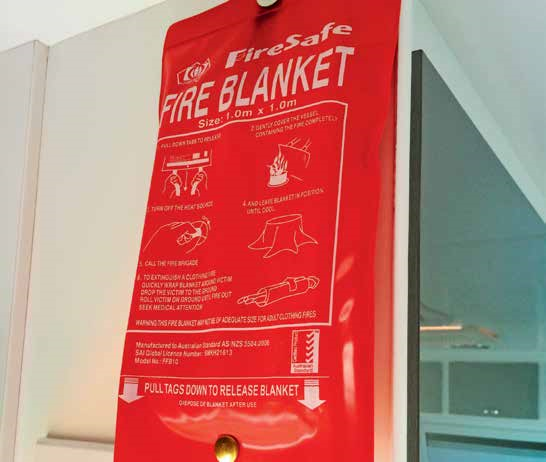 Always have a fire blanket in the kitchen area. In the event of a fire inside the RV do you have a plan of escape? If you were woken up in the middle of the night by the smoke alarm and there was a fire blocking the main exit, what would you do? It’s important to think about this and talk it through with those travelling with you. Have an escape plan in place so that everyone knows what to do to stay safe. This applies not only to fires, but also other natural disasters, such as wild storms, which can also require you to use your emergency exit plan. - Ensure you have fire extinguishers throughout your vehicle and that everyone travelling with you knows where they are and how to use them. - Anytime an extinguisher is used at all, replace it. - Change smoke detector batteries regularly. - Check wiring to make sure the connections are secure and have any damaged wires repaired or replaced. - Discuss evacuation with everyone travelling in your vehicle and go over how to operate latches and escape hatches for a quick exit in the case of a fire. - Always stay in the area while cooking and be sure to keep combustibles away from the cooktop; food or other items, such as paper towels or curtains, may be ignited by the stove.